Selecting the proper hitch for, both, your tow vehicle and camper is one of the few steps as a new RV owner that you, simply, cannot afford to get wrong. Unfortunately, the number of hitch options and class ranges available for today’s vehicles makes for an intimidating market for many first-time RVers. Luckily, our in-depth guide is here to help you navigate the world of RV hitches. 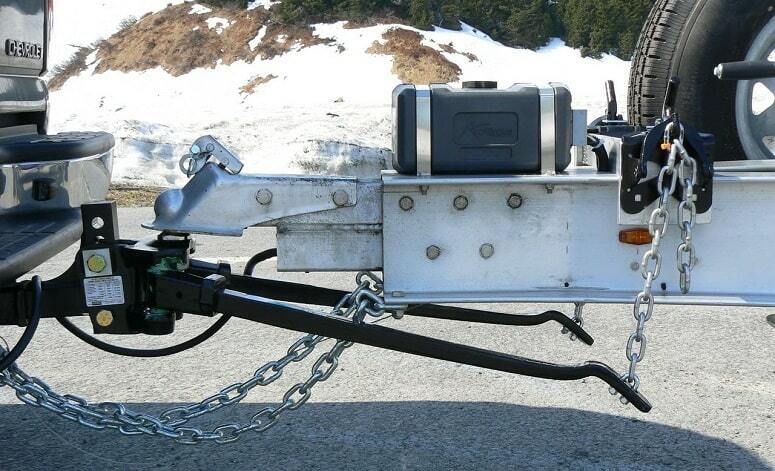 When Do You Need A Weight Distribution Hitch? When selecting top choice products, we look for that perfect blend of product performance and price. That is, exactly, what we found with the Camco Eaz-Lift Elite. Not only did it accomplish its purpose of better weight distribution and handling, we loved the ability to turn off the sway control for towing around town or other situations where having it on can actually diminish control. Maximum gross trailer weight (GTW) = 10,000 lbs. While the Husky Center Line comes in close to $100 more expensive than the Camco Eaz Lift, it may be the most universal hitch available. We love how it can be used for a wide range of tongue weights that would require different units in other brand hitches. This is great feature if you’re TW changes with additional cargo or vehicle modifications. The quiet ride of its sway control function is, also, a big plus. Maximum GTW = 12,000 lbs. This is an impressive value option offering everything you need and nothing that you don’t. If you don’t need the hydraulic brake capability of higher-end sway control systems, then this hitch might be perfect. We think this hitch would work best for folks towing less than 6,000 lbs., otherwise you would still need to purchase an additional sway control bar. Honestly, this could have easily been our top pick and clearly others agree. The Fastway hitch received some of the highest customer satisfaction rates among the weight distribution hitches that we reviewed. The integrated, dual-point sway control is much easier to install than a chain system and it came in at the lightest weight. This is an all around great hitch for most towing needs. Maximum GTW = 8,000 lbs. TW Rating = 800 lbs. Versatile use with most trailer styles, RV’s, horse trailers, boat & cargo haulers, etc. Sway control and weight distribution are integrated into one system – no need for additional parts, mounting brackets, etc. If you’ve experienced significant control concerns with your RV in the past, regularly tow heavy loads, or are just looking for the maximum protection available, then the Equal-i-zer hitch might be perfect. For the average customer towing their RV, however, we’re not sure the cost is worth the nominal performance increase. Maximum GTW = 10,000 lbs. You may have the perfect camper, and you may have the perfect truck or SUV to tow it, but without the proper hitch, your dream of new adventures and life on the road will remain just that, a dream. Selecting the proper hitch to tow your new RV may just be the single most important element to safe and happy camping, and it’s easy to see why. Towing anything down a highway carries considerable risk, whether it’s a bicycle rack or a farming trailer. When you add a 4,000 – 8,000+ lb. RV or fifth wheel trailer to the equation, you’re entering a whole new level of risk, not just to your valuable, mobile home, but to the thousands of motorists that will be sharing the road with you while cruising along at 65 mph. With discussions highlighting different hitch styles, classes, and weight capacities, you’ll soon feel confident in choosing the right match for your RV towing needs. While we have described numerous hitch types below to help with your understanding of what is available, this guide will be focused on weight distribution hitches, the industry leading selection for RV towing. Already pre-installed on many trucks and large SUVs, the receiver hitch is the most common hitch installed on vehicles. Receiver hitches are mounted directly to your tow vehicle’s frame and feature a square receptacle (size will vary) for insertion of tow accessories, whether it be a bike rack or a fully featured weight distribution hitch. Receiver hitches are broken into varying classes which will determine the hitches’ maximum tow capacity, as well as the size of its square receptacle. Gross tow weight (GTW) up to 2,000 lbs. GTW up to 3,500 lbs. GTW up to 20,000 lbs. This is a heavy-duty hitch that mounts directly within the bed of a pickup truck and is centered over the rear axle. They are designed to receive the kingpin from your RV and have large carrying capacities from 16,000 – 25,000 lb. capacities. Unfortunately, they do take up significant cargo space within your truck bed when not in use. Many RVers still prefer a 5th-wheel hitch, however, as they tend to be more stable on the road than many traditional tongue hitches. 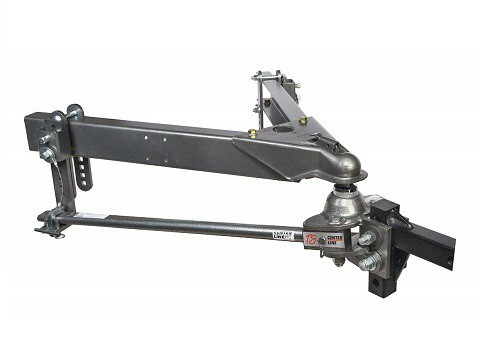 As a solution to the common downsides of a 5th-wheel hitch, a gooseneck hitch usually involves a standard-looking ball mount installed just forward of a truck’s rear axle. This allows for large towing capacities when needed, yet maintains near maximum cargo capacity within the bed of the truck when not. A gooseneck hitch could be the preferred choice if you use your truck commercially, say as a construction worker or contractor, in addition to your RV camping needs. 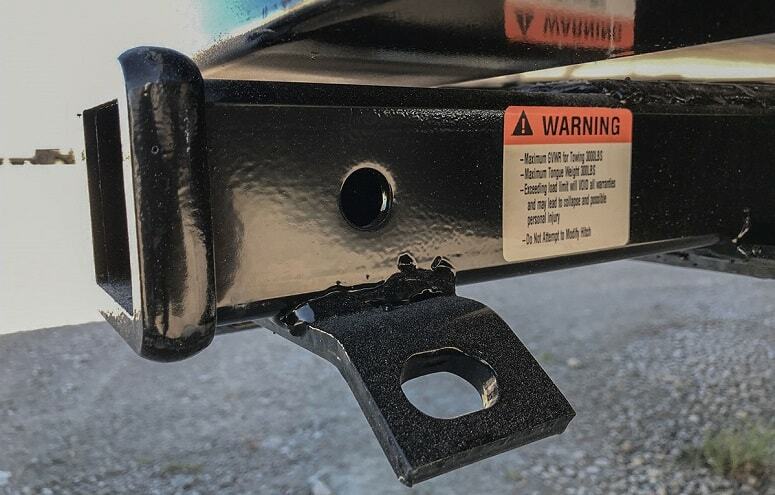 Limited to the weight capacity of your vehicle’s bumper, these hitches should not be considered for any real towing solutions beyond a lightweight rack for beach supplies or camping gear. A weight distribution hitch, which is inserted as an accessory/addition to a standard receiver hitch, helps maintain an even weight distribution onto your vehicle’s and camper’s axles. They are shaped in a ‘v’ orientation with two spring bars that connect trailer to tow vehicle. Higher end models will, also, include sway control measures. 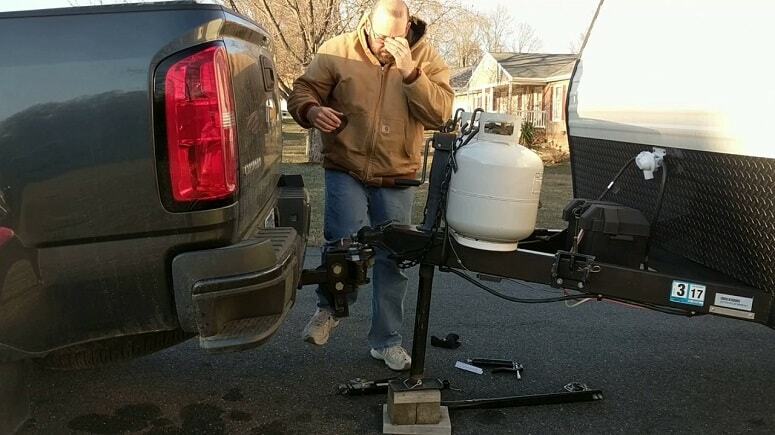 A ball mount hitch is the most common and affordable way to tow a trailer, boat, rv, or pop-up camper. It features a steel sphere (the ‘ball’) connected to a metal bar that is inserted into your vehicle’s receiver hitch. Combined with a trailer coupler of the matching size, the ball mount hitch allows a secure connection and ample pivoting ability as you turn corners. There are a few common indicators that can help you justify the upgrade to a weight distribution system. Upgrading to a weight distribution hitch will, typically, increase your class 3 or 4 hitch GTW capacity by more than 40%. Measure the distance that your front bumper sits above level ground before and after connecting your RV. If the difference is more than ½”, you would benefit from a weight distribution system. If you notice less control with your vehicle while towing your RV, then there’s a good chance it’s time for a towing system upgrade. If you’ve noticed that the bottom of your hitch, often, scrapes against the ground when going over small curbs or surface changes in the pavement, then it’s time for a weight distribution hitch. Unlike single axis bar attachments, like with a standard ball mount hitch, weight distribution hitches utilize dual spring bars to better leverage the tongue weight of your RV. Rather than transferring your RV’s tongue weight directly onto your vehicle’s rear axle, this system allows for the weight to be distributed evenly among each axle throughout the RV and tow vehicle. 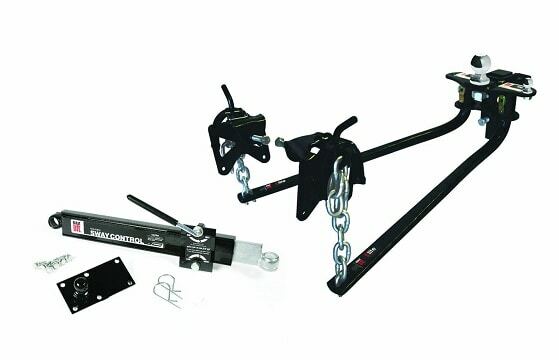 WHAT PARTS COME WITH THE PURCHASE OF A WEIGHT DISTRIBUTION HITCH KIT? These are the two levers that handle the bulk of your weight distribution. They are connected to the head assembly on the back of your vehicles and then to your RV’s frame, either with chainlinks or integrated brackets. Your kit will include two brackets designed to be mounted on each side of your RV’s hitch frame. This is where the spring bars will be attached. Some hitch kits already come with the ball included. If not, you will need to purchase it separately in order to use your weight distribution hitch. Since the engine is located over the front axle in most vehicles, a disproportionate downward force on the rear axle, as is often the case without a weight distribution system, will cause a loss in control as the front tires are raised. This can be a very unsettling feeling while driving down the road with a large RV in the rear-view mirror. A weight distribution hitch prevents overloading of the rear axle, and allows you to maintain good FWD or AWD control with your vehicle. Ensure that your hitch, front portion of your RV, and rear bumper of your vehicle all stay above the pavement during surface changes or small bumps with a weight distribution hitch. One of the scariest moments as an RV owner is the first time that you experience trailer sway on the highway. Whether it was caused by a gust of wind or a surface imperfection in the pavement, the loss of control from trailer sway is a serious catalyst to many RV accidents. Prevent this sway, or limit it significantly, with a weight distribution hitch. Many models feature integrated sway control components and even those that don’t can be outfitted with accessory bars for the same purpose. The use of a weight distribution hitch is one of the only ways to instantly increase your towing capacity. Most class 3 and 4 receiver hitches (what you, likely, have if towing an RV) indicate two GTW capacities, one with and one without the use of a weight distribution hitch. The capacity available with the system is, usually, 40% – 50% higher than without it. Setting up your new weight distribution hitch for the first time can be intimidating if you have never installed one before. While the process for installing the hitch is simple enough to tackle on your own, the consequences of getting it wrong are, obviously, high. We, strongly, recommend having a professional walk you through installation and hook up the first time you attempt to connect your RV. 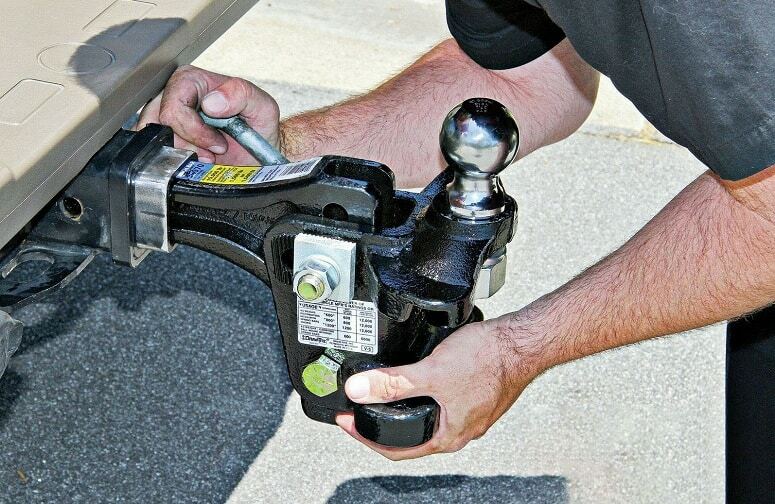 For those of you who already have experience with hitch installations or are feeling confident with your DIY skills, check out our guide below for the steps necessary to connect your weight distribution hitch. Back your tow vehicle up into a preliminary towing position, still leaving 2-4 feet between your RV’s coupler and your truck’s receiver. This will allow for easier comparison between your trailer coupler height and your truck’s receiver hitch. Insert your hitch’s bracket into the square receiver of your truck or SUV. Whether you orient the bracket in an upward or inverted direction will depend on the height difference between your trailer coupler and truck hitch. Align the head assembly of your hitch, complete with ball mount, onto the bracket that you installed during the previous step. Ideally, the ball will sit 1” – 3” above the height of your RV’s coupler. Place flat washers onto the adjustment rod head (most hitches come with 2 heads of slightly varying height) and place it into the center hole on the inside of the head assembly. Pivot the head back up into position and confirm that the ball is sitting in a vertical orientation, or slightly away from the vehicle, when the adjustment rod is tight against the shank. Make adjustments if necessary. Secure the head assembly to the shank with the provided hex bolts, washers, and nuts and proceed to tighten the top bolt/nut so that the head is firmly connected to the shank. Grab the two spring bars that came with your hitch kit. Depending on the model, you may have to install the chainlinks. Align where the chain will hang perpendicular to the arm of the trailer and make note of where you will need to install each chain lift bracket. Your ultimate towing capacity will depend on several factors, such as your vehicle’s build quality, engine design, and what type/class of hitch you have installed. First, you’ll need to confirm that your vehicle’s tow capacity matches or exceeds that of your RV. The addition of a hitch, regardless of type, will never increase your vehicle’s overall towing capacity. Ideally, you are aware of this number before purchasing a new RV. I have known multiple RV owners who bought a new camper, only to realize that their current truck was not rated to haul the additional weight. A forced truck upgrade may seem exciting, but it, also, adds a considerable expense right after the purchase of your new RV. This number references the fully loaded weight of your RV in the condition that it will be towed. This number should never exceed your vehicle’s tow capacity (TC). As we mentioned above, you will, also, need to determine your tongue weight when selecting a weight distribution hitch. Tongue weight is, essentially, the amount of force placed upon your hitch once your RV is connected to your vehicle. It is a combination of your RV’s weight near the front and the cargo weight stored in the back of your tow vehicle (behind the rear axle). It is imperative that you measure this number correctly, so that you can choose the right hitch rating. If you buy a weight distribution hitch too far above your tongue rating, it is possible to end up with an overly stiff system that can compromise the hitch’s function. Conversely, if you purchase a hitch with a tongue weight rating too low, it won’t be safe to operate. Your RV’s tongue weight rating should be listed within the owner’s manual, as well as on the label found on the front hitch frame of the RV. Remember to consider the weight of full tanks, if you, frequently, travel that way. Most weight distribution hitches have similar installation steps, however, there are some key differences that will make some way more suited to self-installation. 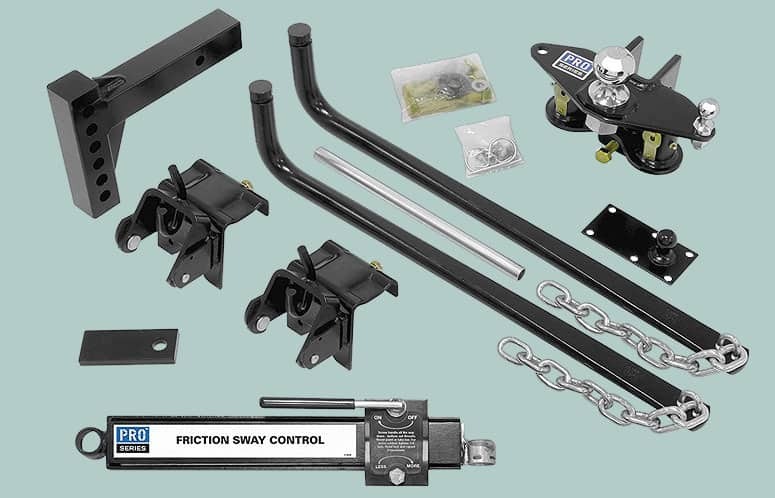 Any system that utilizes independent friction sway control (the separate bar that comes with many kits) will require more time and hardware to install than those whose sway control is integrated into one system. Additionally, the bar will need to be removed from the hitch before reversing the RV or navigating tight turns, which can be an inconvenience. Most RV owners agree that the dependent, or integrated, sway control systems are easier to install than the traditional chain link connections. If you are concerned with ground clearance, trunnion style spring bars, as opposed to round, will give you the greatest clearance as you navigate over changes in pavement or bumps in the road. It may seem counter-intuitive, but there are a few situations where an additional sway control element can, actually, hinder your safety when towing an RV. For tight turns in reverse or ‘jackknifing’ your trailer into a campsite or storage location, it is recommended that you remove any independent sway control bars. Not every hitch system will have this restriction and so you may wish to confirm this detail if you frequently reverse your RV at sharp angles.